The Congress is all set to extend unconditional outside support to Arvind Kejriwal-led Aam Aadmi Party for aiding the process of government formation in Delhi. At a strategy meet chaired by vice- president Rahul Gandhi chaired at his Tuglaq Lane residence today, Congress' eight elected MLAs favoured backing the AAP "to help the fledgling political outfit fulfill its poll promises which have raised the hopes of Delhi voters". The Aam Aadmi Party might have stumped political veterans with its spectacular performance in the Delhi Assembly elections, but the fact remains that its "transparent and honest politics" in a way failed to have the desired appeal on rural voters. Shiromani Akali Dal (Badal) Delhi chief Manjit Singh (GK), who is also president of the Delhi Sikh Gurdwara Management Committee (DSGMC), said if re-elections were held, Aam Aadmi Party (AAP) would be a challenge for the BJP-SAD, not the Congress, as majority of the Congress candidates who lost were on third position. Nationalist Congress Party chief Sharad Pawar is all set to wrest major concessions from the Congress which was thoroughly humiliated in the just concluded Assembly elections in five states. The regional party is all set get away with its demand for contesting 22 of the 48 Lok Sabha seats in Maharashtra. The Andhra Pradesh Assembly has turned into a battleground for a bitter showdown on the draft Bill for creation of a separate Telangana state. The legislators on either side of the regional divide are gearing up for a stormy debate over the AP Reorganisation Bill, 2013 which has been referred to the Assembly for its opinion by President Pranab Mukherjee. Endorsing the view that opinion and exit polls were in a position to influence the voters, former Chief Election Commissioner SY Quraishi today disagreed with the observations that any ban on it should be seen as against freedom of speech and expression. Ahead of the Lok Sabha elections in 2014, the Union Cabinet today cleared an all-new disability law, raising the reservation for Persons with Disabilities (PWD) from three to five per cent. The disabled will get the benefit at all government educational institutions and jobs. Professional jealously seems to be the real reason behind the infamous CD sleaze episode involving the now suspended Additional Secretary JP Joshi in Uttarakhand. The police today arrested another PCS officer Suman Singh Valdiya for allegedly conspiring with the 26-year-old woman for preparing the CD with the motive of ensuring promotional setback to Joshi. A Delhi court today reserved its order for December 14 on framing of charges against sacked Uttarakhand minorities panel chief SS Namdhari and 21 others, arrested in connection with the killing of liquor baron Ponty Chadha and his brother Hardeep in a shootout last year. Already facing 85 cases pertaining to discrepancies in land deals, benami transactions and misuse of government allocated lands meant for social-health purposes, Yog Guru Ramdev-owned Patanjali Yogpeeth Trust has been found evading stamp duty in 11 cases. In a setback to the UP government, the Allahabad High Court today held that it could not withdraw prosecution in terror cases, in which the accused had been booked under central acts, without Centre's permission. The Supreme Court today directed the Centre and the state governments to extend the transport allowance being paid to employees with vision or lower limb disabilities to those suffering from loss of hearing as well. The killing of two school students in an alleged “fake encounter” by security forces in Chirang district of Bodoland Territorial Autonomus Council (BTC) on December 11 has sparked widespread protests. The managing director of a diamond company has been arrested for allegedly cheating his brother, also a managing director in the company, to the tune of Rs 90 crore, the police said here today. Top sources in the Congress said the MLAs felt people's mandate should be respected and the AAP supported from outside. "Though the MLAs told Rahul that they were ready to face fresh elections, they said extending support to the AAP from outside would ensure that another election is not thrust upon city's voters," a senior leader told The Tribune. He said the MLAs, having made their point, had left the final decision to Congress high command. As reported by The Tribune yesterday, the Congress is planning to ensure that Kejriwal either forms the government in Delhi with its support or explains to voters why he is running away when he has a real chance of fulfilling his lofty poll promises. A Congress MP from Delhi said, "Why should he have a problem with our outside support? If he has any, let him stand exposed." The Congress, relegated to a third slot in Delhi assembly, is seeking to corner AAP over promises of free water, reduced power tariff etc made in the poll manifesto which, it feels, cut into its political support base. "We can give affidavits to the AAP writing whatever they want. We don't even want power-sharing. We just want to ensure a stable AAP government because we can only support a secular party and not the BJP. Why should AAP have any resistance in that case? They say they have fight against a corrupt Congress. Well, considering we will be outside the Government, how does it matter to AAP? Does Kejriwal, who speaks for anti-corruption, want another election thrust on Delhi?" a Congress leader from Delhi asked. Keeping this in mind and realising the enormity of the challenge of the 2014 Lok Sabha poll, the party has lowered its ambition and declared not to contest all 543 LS seats. "We will not contest all seats. We will contest only those seats where the wining probability is high. 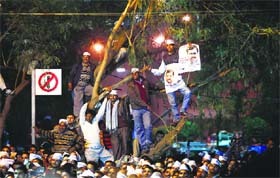 We have told our district committees to identify such seats," said Bipul Dey, AAP campaign in charge in Delhi. Party's district committees in 309 districts of 22 states have been designated the work of identifying the seats where the party has high chances of winning. Senior party leaders, including the activist-turned politician Arvind Kejriwal and psephologist Prof Yogendra Yadav, said money power, liquor distribution and the deep-rooted vote-bank psyche dented the party's prospects among the Muslims in the Delhi Assembly elections. Though the electorate's mood was in favour of the party, the events that unfolded during the last 72 hours, including the exit polls showing AAP securing just 5-6 seats, could have resulted in a good number of voters changing their mind, thus impacting the results, they said. "The rival parties used illegal means of money and liquor to do rest of the damage," Yadav said. AAP leaders admit that party's anti-corruption pitch and innovative mass-contact programmes could not translate the support wave into votes, especially in the rural belt of the National Capital. The party's impressive win on 28 seats came largely due to the support of urban middle-class voters, thus giving poll analysts a reason to view it as an urban phenomenon. Party's performance in the city's rural belt and unauthorised colonies fell short of its own expectations. In constituencies such as Najafgarh, Nagloi Jat, Narela, Bawana Babarpur, Badarpur, Badli, Bawana, Bijwasan, Ghona, Gokalpur, Mustafabad-mainly comprising villages and unauthorised colonies-AAP finished as a runner-up. The party, however, won nine out of the 12 reserved constituencies where voters predominantly belonged to the Scheduled Castes category. Members of the minority communities, including the Muslims, apparently did not vote for AAP thinking the BJP would benefit if they did so. "Minorities considered us good, but they opted for the Congress in the fear that the BJP would otherwise get the majority. We had created substantial support among the Muslims, but that couldn't be converted into votes," Yadav added. Felicitating Akali Dal MLAs Manjinder Singh Sirsa, Harmit Singh Kalka and Jatinder Singh Shanty today, Manjit said the BJP-SAD was the single largest party in Delhi. AAP had won 28 out of 70 seats and keeping this in view, the alliance would take AAP as a challenge. Manjit honoured the Akali Dal MLAs with “saropa” and a sword. Hari Nagar candidate of Akali Dal, Shyam Sharma, had lost the seat but he was also honoured on teh occasion. Manjit said there was no chance of Congress coming back to power in Delhi. “In Uttar Pradesh, Bihar, West Bengal, Madhya Pradesh and Chhattisgarh, the Congress has been out of power for the past many years. When voters get an alternative, they leave Congress,” he said. On being asked about his plans in case re-elections were held, he said his party had the capability of contesting another election. He said as far as parliamentary elections were concerned, the party high command would take the call. Nationalist Congress Party chief Sharad Pawar is all set to wrest major concessions from the Congress which was thoroughly humiliated in the just concluded Assembly elections in five states. The regional party is all set get away with its demand for contesting 22 of the 48 Lok Sabha seats in Maharashtra. In addition, Pawar's men are also looking to swap some of their seats with the national party. "We need NCP chief Sharad Pawar to campaign for the alliance during the Lok Sabha polls," an office-bearer of the Maharashtra Pradesh Congress Committee said. In the past, the Congress had laid claim to more seats on the grounds that it had done well in the local body elections. However, the results of the Assembly elections have forced the grand old party to compromise. Moreover, the demise of senior party leader Vilasrao Deshmukh has left the Congress part without a senior leader who can campaign for the Lok Sabha elections. Minister Prithviraj Chavan is not seen here as a grass-roots level leader. Pawar and his nephew Deputy Chief Minister Ajit Pawar are now all set to have their way in the choice of seats contested by the Congress. In return for climbing down, the NCP is all set to lessen the pressure on the Congress. Two of its MLAs and two Independents owing their allegiance to the Pawars had threatened to resign from the state Assembly ostensibly to push for regularising illegal constructions in Pimpri and Chinchwad townships near Pune. Sources say these MLAs will withdrawn their resignations following a face-saver by the Chief Minister. Congress leaders say they will begin seat sharing talks with the NCP after the winter session of the Assembly. The draft Bill reached Chief Secretary PK Mohanty today and would soon be sent to Assembly Speaker Nadendla Manohar for placing it before the House. The President is believed to have given six weeks to the Assembly to communicate its views on the draft Bill. The ruling Congress is facing an unusual situation with the rebellious Chief Minister N Kiran Kumar Reddy himself leading the fight against a legislation proposed by his own party government at the Centre. Never in the history of the state did such an occasion arise. The Chief Minister has vowed to defeat the Bill in the Assembly to send across a strong message to the Centre that a majority of the people in the state are against division. For the first time, a debate in the Assembly will not be based on political loyalties but on regional lines. While legislators from Telangana region, which accounts for 119 members in the 294-member House, have been rooting for early completion of the bifurcation process to fulfill the long-pending dream of the region, the MLAs from Rayalaseema and coastal Andhra, jointly referred to as Seemandhra, are strongly opposed to the division and are determined to stall the process. Amid an intensifying internal turmoil, AICC General Secretary in-charge of AP, Digvijay Singh, arrived here today on a two-day mission to persuade the party legislators from Seemandhra to abide by the high command’s decision and cooperate in the smooth completion of the bifurcation process. However, during his 30-minute meeting with Singh at Lake View Guest House, the Chief Minister is believed to have made it clear he would not preside over the division of the state and sought reversal of the decision to split the state. The visiting AICC leader reiterated his appeal to the Chief Minister to cooperate in the bifurcation process and assured that the concerns of the people of Seemandhra would be fully addressed. On their part, a delegation of the Telangana Congress leaders met Singh and made out a strong case for speeding up the division process so that the next Assembly elections, scheduled in April/May, 2014, could be held in two states. The seven-day winter session of the Assembly, which started on Thursday, was adjourned after members paid tributes to Nelson Mandela. When it reassembles on Friday, fireworks are expected between the Seemandhra and Telangana members. Delivering the 34th Bhim Sen Sachar Memorial lecture on:``Importance of pariticipation in Democracy'', he expressed surprise over observations made during debates on television in the run-up to the recent Assembly elections. Quraishi said there have been several judgements by the Supreme Court laying emphasis on the importance of free and fair polls in a democracy. Citing an instance, he said, political parties have told the Commission that survey houses have approached them to tailor the opinion poll so that a ``hawa'' (wave) could be made its favour. ``Do we have the freedom to deceive...by making a hawa (wave) ?... he sought to know. The former CEC also rejected the idea of enacting a law to make voting compulsory stating that instead the effort by the Election Commission was to spread awareness and encourage greater participation. He said there has been a quantum jump in the voter turnout since the EC launched its voters awareness campaigns. Titled "The Rights of Persons with Disabilities Bill, 2013," the new law will replace the archaic PWD Bill of 1995. "This is in consonance with the UN Convention on Rights of Persons with Disabilities, which India signed in 2007, Social Justice Minister Kumari Selja told The Tribune. Till now, the reservation for the disabled was only 3 per cent in the ratio of 1 per cent each for the physically, visually and hearing-impaired. The new law extends the quota by 2 per cent, covering two new categories — mentally disabled and people with multiple disabilities. In another major move, the new law provides 19 categories of disabilities as against seven in the 1995 law. After much debate, sickle cell disease, thalassemia and muscular distrophy have been included as new disabilities in a total list of 19 (see box). For the first time, the law will define the meaning of disability, preventing harassment that PWDs had to face while getting disability certificates made. Anyone suffering 40 per cent disability or more will continue to be defined as a PWD. All rights of accessibility, health and employment guaranteed by the new law will be justifiable and can be contested in special disability courts that will be set up. Anyone violating the law will face six months or five years in prison and/or Rs 10,000 fine. The law also provides for the establishment of the National Commission for Persons with Disabilities, which will have statutory powers. Uttarakhand DGP BS Sidhu said the interrogation of arrested girl’s accomplice Neeraj Chauhan had revealed that PCS officer Suman Singh Valdiya used his contact with the girl to get the CD prepared as he wanted to use it to dent Joshi’s career. “Valdiya was of the view that after the contents of the CD became public, JP Joshi would not get his promotion and thus get superseded, thereby brightening up his own promotional prospects down the line,” Sidhu said. 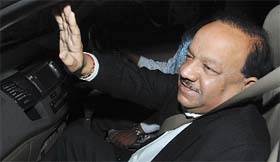 While Valdiya managed to get the CD prepared, it could not be telecast immediately as the so-called TV journalists had started blackmailing JP Joshi and by the time the contents of CD got public, Joshi had already got promoted as the Additional Secretary, thus defeating the very purpose for which the CD was prepared, Sidhu added. The DGP said Ritu Kandiyal knew both JP Joshi and Suman Singh Valdiya and it was she who had introduced the girl to both of them. He said the police were on the lookout for Ritu Kandiyal and would take action if she did not cooperate in the investigation. "Come for order on December 14...," Additional Sessions Judge Vimal Kumar Yadav said while asking the defence counsel to file arguments in written also. The court reserved the order after arguments on framing of charges were concluded by the Delhi Police and the 22 accused. The counsel for the Delhi Police had claimed before the court that all 22 accused had conspired together to kill Ponty's brother. 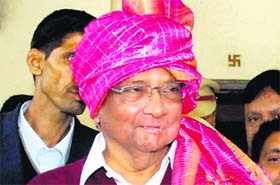 Namdhari and others, however, refuted the allegations of the probe agency and had said that they are "innocent" and have been "falsely implicated" in the case. Ponty and Hardeep, who allegedly had a property dispute, were killed in a shootout at a Chhattarpur farmhouse here on November 17 last year. During the course of arguments, the prosecution had told the court that the two brothers were not on talking terms as there was property dispute between them. "The dispute had not resolved on November 16, 2012 night, so the planning was to take away the property by any means, in which the two brothers were killed," prosecution had said. The prosecution had also narrated the sequence of events leading to the final act of murder and said Ponty, Namdhari along with 21 of their men had conspired to take over the farmhouse from Hardeep's possession. It had said, Hardeep had arrived at the scene and when Ponty's men were opening the gate of the disputed property, Hardeep fired at them and also at Ponty, and in return Namdhari and his PSO Sachin Tyagi shot Hardeep. These cases violate the norms of the Indian Stamps Act. Now total number of cases filed against Ramdev trusts has reached a whopping 96 in just a month time. They range from stamp duty evasion to violation of Zamindari Abolition and Land Reforms Act (ZALR). Talking to TNS, District Magistrate Nidhi Pandey said the cases have been registered against Patanjali Yogpeeth Trust, Haridwar for evasion of stamp duty. The ruling was given by the HC’s Lucknow bench comprising Justices Devi Prasad Singh, Ajai Lamba and Ashok Pal Singh on questions raised by a two-judge division bench on a PIL filed by Ranjana Agnihotri and five other local lawyers. The PIL had sought a direction for quashing the order of the UP government for withdrawal of cases against people accused of blasts and terror activities that included 2007 serial explosions in Lucknow and Gorakhpur. “Human dignity of a deaf and dumb person is harmed when he is being marginalised, ignored or devalued on the ground that the disability he suffers is less than that of a visually-impaired person which, in our view, clearly violates Article 21 of the Constitution” that guaranteed personal liberty, a Bench comprising Justices KS Radhakrishnan and AK Sikri ruled. “Comparison of disabilities among persons with disabilities without any rational basis is clearly violative of Article 14” (right to equality) as well, the Bench held while allowing a PIL filed by the Deaf Employees Welfare Association and another. The SC pointed out that the Persons with Disabilities (Equal Opportunities, Protection of Rights and Full Participation) Act, 1995 had listed seven disabilities - blindness, low vision, leprosy-cured, hearing impairment, locomotor disability, mental retardation and mental illness - without drawing any distinction. All Bodo Students’ Union (ABSU) today moved National Human Rights Commission (NHRC) and National Commission for Protection of Child Rights (NCPCR) against the killing of the “two students” by security forces. The state police said the two youth were members of Sangbijit faction of the outlawed National Democratic Front of Bodoland (NDFB). The duo was killed in an encounter with a joint team of the police and the Army at Raidangbari under the Runikhata police station in Chirang district. The deceased were identified as Jeremiya Narzary (Class X) and Pranjit Narzary (Class VI). One Nikodim Narzary (Class VII) sustained serious injuries. Pranjit and Nikodim were students of Salbari Middle English School. The killings sparked violent protests across BTC areas.